The casual jumpsuit is a thing. It has been for some time. I like to spot them out and about …. they cycle past, I see them in cinemas and in cafes; I’ve spotted them in work meetings and even out walking the dog. They have me tracking them down the street like a stalker – a sewing stalker. I could make that! Such a simple cut and often in a rich linen. Sadly I am a jumpsuit virgin. They are not my bag and I’ve always been pretty sure they will pass me by. Let’s cut to the end of the story. You can see the photos… I made the jumpsuit. Despite my serious camera face, I’m actually so happy with this onesie. A heartfelt thank you to In the Folds and Peppermint Magazine for the incredible (FREE!) pattern . For a sewing review more technical than I’m capable of, read this one from Jane at The Drapery (how I love her green jumpsuit). I share her hope that Emily from In the Folds gets paid a truckload and hope that Peppermint Mag appreciates the work that goes into these patterns. I’m truly in awe of pattern makers after making our simple Bombazine mitt pattern. A free pattern is a holy gift! The fabric I used is a black seersucker with tiny white printed crosses. It’s a light cotton but the dense weave and seersucker texture give it good structure. Note satisfying leg volume. I bought mine in Kyoto and I’ve also spotted it here and here – or if you’re after a cross-free seersucker this is delicious too. As is my usual style, I bought barely enough fabric – squeezing this thing out resulted in a garment that’s just a shave off a zero waste situation. I was dutiful and made a toile because I’m getting better at sewing discipline – and I was worried the body might need lengthening. Turns out the fit was perfect, hooray for pattern makers that draft for ‘real’ bodies! (By real of course I mean not a stick thin supermodel – I know that every body is real. All of them). 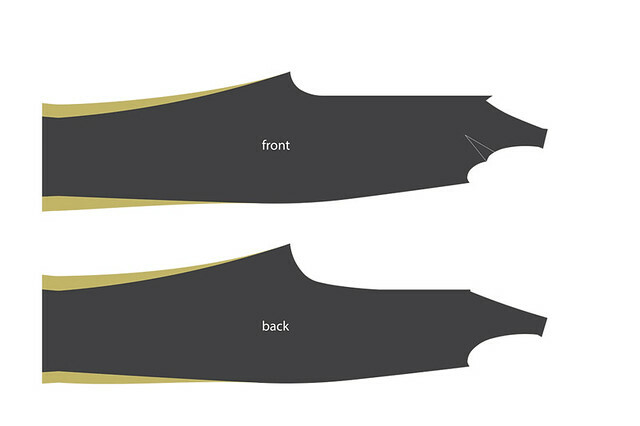 I made a size C. Clearly I meddled with leg width – this was super easy (below is a layman’s diagram of how I widened my legs). I was careful to add equal amounts on the front and back pieces and the inner and outer leg. The pattern is expertly executed and a quick and simple sew. You have to trust the pattern at the Burrito facing stage because it makes little sense until the final unveil – but that’s the beauty of following clever drafting! My last little hack was to make the tie extra-long so I could cross it over in a loop at the front and have the tie at the back. Bows and ties are fashion’s bounty but when I wear them they bug me. I’m not very decorative and prefer function and comfort so this is a neat little tie solution. So that’s my story – start, end and middle – and this is my casual jumpsuit. Time to walk the dog! You look amazing! Love the material and your choice of shoes. This one is on my list but can’t decide on fabric! Such a funny post and a gorgeous jumpsuit! I’ll go check out the pattern immediately! I love what you’ve done with the pattern to make it suit you! I’ve been thinking about this jumpsuit pattern for the longest time and really want to sew it, but I could never get myself to get started – I’m pretty sure it was because of the tapered legs. I also considered widening the legs, so, it’s great to see how it might turn out; thank you for this post! I adore your hack! 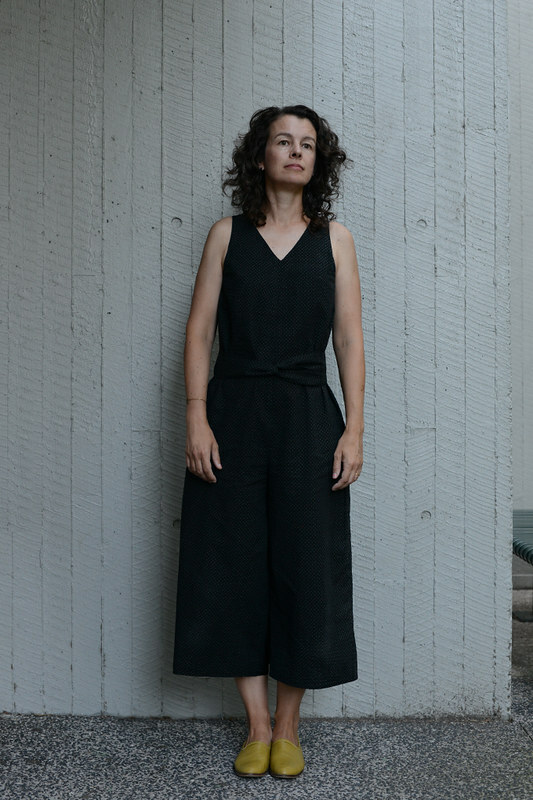 Like you and many others I’ve flirted with the idea of a jumpsuit, but suffer concerns about it accentuating my longer torso to leg ratio and the evident toileting worries. I mean who wants to disrobe entirely in a public restroom with the risk of mishandling your entire outfit into a questionable puddle on the floor? Yep I’ve thought this through. I love the wide-legged hack though and I’m feeling very tempted. Can I ask I about how much width you added at each of those points? Did you slash and spread or literally add at the seam line? Well! This is very chic indeed! Much impressed am I! Great design, lovely jumpsuit, you have inspired me to try this pattern. But, what is the difference between a jumpsuit and dungarees, I wonder!? Hmmm such a good question… maybe shoulder straps? But I think you have a point fashion is blurring these two! HOORAY HOORAY I’ve been looking forward to seeing these in the wild! I recently assembled the PDF pattern but have been nervous to get stuck in (lots of fabric = money = commitment = oh good, fear). Yours looks fab. Everyday wearable but elevated. I LOVE your wide leg cropped version! I’ve been wanting to make one but this really inspired me to give it a try. It’s beautiful! I have been thinking about this jumpsuit for a while. I never had one, but maybe is about time, and yours looks really good. How much fabric did you use? I’m not sure – I’m famous for buying too little and am left with a hideous puzzle trying to squeeze the pieces out. And thank you.